No Bute for Horses is a leading herbal joint supplement to support the health of joints and their connective tissue in a completely natural way. Containing Devil’s Claw which has been proven to have anti-inflammatory properties, No Bute Horse Supplement can be effective at relieving joint pain, osteoarthritis and even pain from laminitis. 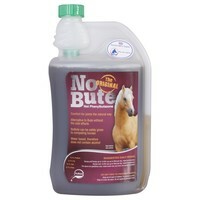 No Bute Horse Supplement does not contain Phenylbutazone. Please Note: Devil’s claw is now a controlled substance under FEI rules, so it’s not suitable for use in competing horses.